Civil war in Syria has forced tens of thousands of people to flee their country of residence. Like Syrian civilians, thousands of Syrian-Armenians moved to other countries, including Armenia and Artsakh (Nagorno Karabakh). A couple of dozen Syrian-Armenian families, many from Kamishli, have made new homes in the Nagorno Karabakh Republic. Some are living in Berdzor - the regional center of Kashatagh (Lachin) or Ishkhanadzor, while the majority live in Kovsakan. The NKR Government and others have implemented various projects to support resettlement in Kovsakan, solve housing and other problems. Several families have already been provided with apartments; in addition, an apartment building is being built. Most of the Syrian-Armenian families were experienced farmers in Syria. Having received land and agricultural loans, they have already begun sowing wheat and barley. Located on the banks of the Voghj River in southwestern Artsakh, Kovsakan is a fertile area, similar to Kamishli. To support the Syrian-Armenians now living there, the Armenian General Benevolent Union (AGBU) recently initiated an important agricultural project. 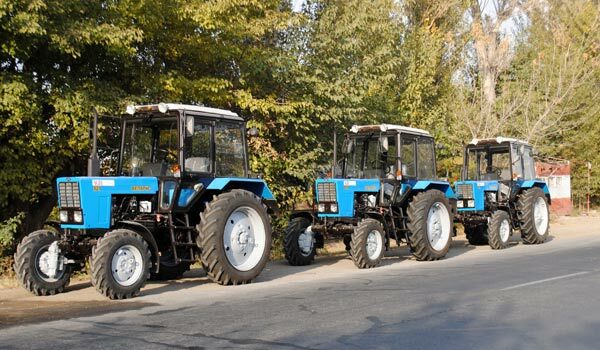 Our compatriots have received new agricultural equipment: 3 tractors (Belarus MT 3-82.1 model), seeders, disks, fertilizer distributors and pesticide sprinklers. Syrian-Armenians involved in farming in Karabakh, enthusiastically welcomed AGBU’s gift. This project will provide a stimulus for Syrian-Armenian farmers, many of whom left their agricultural equipment in Syria, to settle in Kovsakan, and become productive farmers. A parking and storage area has been acquired for the equipment. Vartan Boghos, a Syrian-Armenian immigrant now living in Karabakh with his family, will coordinate the program and oversee the usage schedule. AGBU has invested around $120,000 USD in this program that will contribute to Kashatagh’s agricultural development and support Syrian-Armenians as they adapt to their new lives.